TDA has called on the federal government to review the maximum loan amounts under the revamped VET student loans program for specialised courses that contribute to the country’s innovation capability. The recommendation is contained in TDA’s federal budget submission. Currently, VET student loans are limited to nationally endorsed qualifications under indexed loan caps of $5,000, $10,000 or $15,000, as determined by the government. “Reliance on centrally defined qualifications is the very antithesis of the innovation and flexibility the Government is seeking, and will limit Australia’s ability to move up the value-chain,” the TDA submission says. Extension of Commonwealth Supported Places to higher education students in TAFE. TAFE SA expects to resolve all 140 students seeking their certification following an audit of TAFE SA courses, by mid February 201, a Senate inquiry was told on Friday. TAFE Directors CEO Craig Robertson told the Senate inquiry into TAFE SA that executives and staff from the institution have worked through the Christmas break to remedy the instances of non-compliance identified by the Australian Skills Quality Authority (ASQA) in an audit last September. He said new assessment tools had been mandated across the institute including in 23 units of competency that require remediation. Of the 1660 students originally affected, 315 were not impacted once it was clear that the electrotechology qualification was not subject to findings, 60 secondary students needed their records updated, which is now complete, and around 880 students will continue training this year with any existing assessment issues rectified during continued study. Also, ASQA has indicated that the qualifications stand for 318 students who have already completed. All students have been invited to contact TAFE SA if they have any concerns about their qualification. The remaining 140 students have issues of assessment which will largely be resolved between TAFE SA and their employers by mid-February, Robertson said. ASQA Chief Commissioner Mark Paterson said that TAFE SA has been granted an extension to March 2 to address the issues identified in the audit, meaning the original regulatory decision has been set aside. “They (TAFE SA) are able to enrol, teach and graduate students,” he said. He also said that a further audit of TAFE SA planned for the first quarter of 2018 would be delayed. TAFE Queensland has won a prestigious award at the AustCham Korea Business Awards. 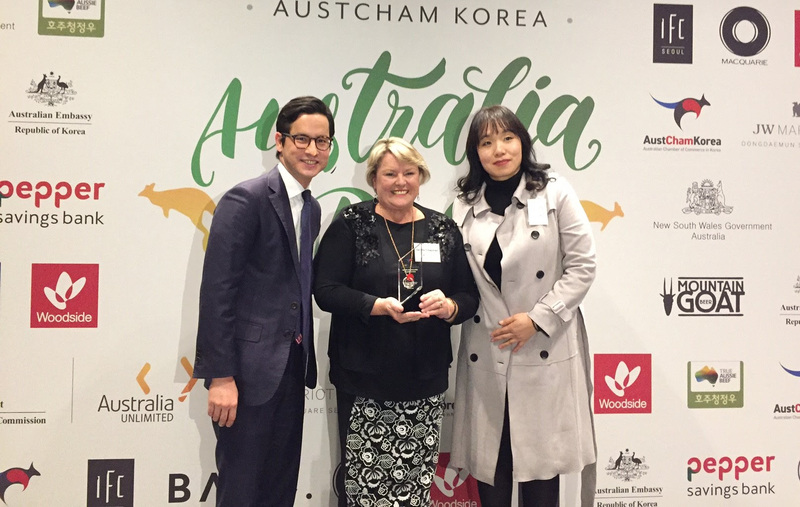 The award in the Education Services category was held as part of Australia Day celebrations in Seoul. The award was accepted by Janelle Chapman, Executive Director of TAFE Queensland International pictured centre, right. The federal government’s skills fund designed to create new apprenticeships could result in employers instead opting to rely on skilled migration to fill vacancies, TDA has told a Senate committee. TDA CEO Craig Robertson, appearing before the Senate Education and Employment Legislation Committee, said the design of the Skilling Australians Fund, could see employers deciding that the lack of public funding for apprentices and trainees from the states and territories would make it easier to resort to skilled migration. “So, the intent of this fund to rebuild numbers in apprenticeships and traineeships may well be lost,” he said. He also said that the requirement for matching funding from the states and territories across individual projects ran the risk of “a whole pile of hodgepodge projects”. “In all of that, the big loser will be national employers who we need to come back into the training system in a big way to start engaging apprentices and trainees,” he said. The Australian Skills Quality Authority (ASQA) is recruiting for the position of Manager, Regulatory Operations, based in Perth. The position is responsible for leading regulatory strategy and risk mitigation projects with the agency. Applications close 16 February. The Department of Foreign Affairs and Trade (DFAT) runs a series of country specific councils, including the Australia China Council and the Australia-Japan Foundation. Other councils, including the Australia-India Council and the Australia-Indonesia Institute, have not yet released their 2018 grant round dates.